Leading and Managing business: When people will share and use knowledge? In sports, we often say 'he/she is an enigma' when performance falls flat despite high promise. It applies to businesses also. Many businesses under perform due to the gap between knowledge acquired and knowledge used. Nowadays companies understand the importance of knowledge and how it can help them gain or sharpen the competitive edge. They are trying with KM systems, and software play a huge role in that. Software help companies to capture, store and channel knowledge. But knowledge sharing (converting the tacit form into explicit one) and using the knowledge in store are outside of the software systems. These two aspects of knowledge management require people to have faith and trust besides other facilitating systems. I have had numerous interactions with people on this issue and what motivates or demotivates people to share knowledge. The diagram given alongside captures those responses and my own observations. It tells us when knowledge sharing will take place or in other words the diagram captures the environment that facilitates knowledge sharing. Listening ears - This is paramount for knowledge sharing. When one learns about an issue or has a idea to share he needs a listening ear. It is men at the front who knows more than the men in corner rooms. Irrespective of where someone is and what he does, he must be listened to when he comes up with an idea, solution or even a problem. Each piece of information thus received should be assessed for its worth and treated accordingly. When one knows his words found a good ear, he will be motivated to share more. Formal record - It is important that each piece of knowledge shared and found useful must be recorded and due credits given. This further improves a person's faith in the system. Feedback / Action - Was the knowedge acted upon? What is the status? Into the dustbin or to the penthouse? Feedback is important as it acknowledges and is also a way of respecting the person who shared the knowledge. Recognition of contribution - When knowledge shared is useful and to be acted upon the same should be recognised and the person concerned be given public credit. Depending upon the importance and criticality of knowledge shared, the concerned person be made responsible for action or be rewarded in other ways. Career growth - Count knowledge sharing for promotions and other recognitions. Rewards are fine but almost everyone would love to move up the ladder. Direction - Last but not the least, direction. Lack of direction can kill a KM initiative. It's just not enough for a CEO to know the direction, everyone must know. Otherwise databases will be full with less or none to act upon. What? Why? How? Where? must be clarified to help people contribute better. Direction alone is a subject for many more posts. I will do it at later. The other challenge of KM, as we already discussed, is making people use knowledge. Primary reason for people to not use knowledge in public domain could be the credibility of knowledge shared. To make people use knowledge shared and feel comfortable and confident in doing so, one may ensure that following are taken care of. Certify knowledge - Once a knowledge shared is accepted as useful then the same should be certified by an appropriate authority. This is more vital for a knowledge that is yet to be used or tested. 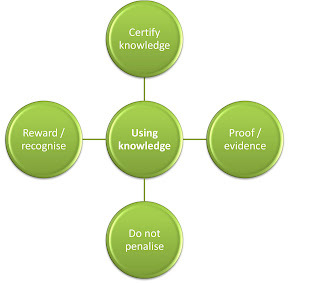 Proof / Evidence - Show evidence of work or benefits of a knowledge acted upon. This helps people to adapt it faster with confidence. More such evidence; more confidence in using new knowledge. Do not penalise - When a knowledge acted upon fails to yield positive results, do not penalise the one who used it nor the one who shared it. Learn from the failure as that's an opportunity to improve things. But never forget to reassess the status of 'knowledge' in question and inform concerned people. When you develop a knowledge management system, remember to keep above points in mind. KM system is not just software but much more than that. People must be prepared, nudged, helped and cared to share and use knowledge. If two big challenges of KM are tackled well then other challenges, if any, can be handled with much more ease. Great work. Beyond that, I am sorry I am not competent to comment. I am happy you are doing this.